The name first appears in Warmington in 1665 and the last record is of a Sarah Faulkner who married a John Cox in 1824. The Faulkners were millers, with some members of later generations following associated trades such as millwrights and bakers. Other family members were millers in the Cropredy and South Newington areas. The Warmington windmill stood high above the village, close to the property now called High Croft. The last windmill, demolished soon after 1900, was a wooden post mill. 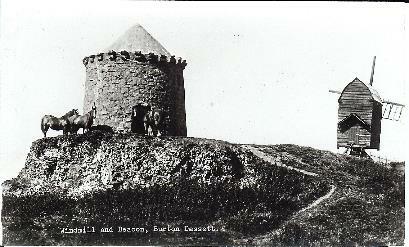 Pictured: Burton Dassett windmill, four miles from Warmington and similar to the one at the top of Warmington village. Millers were in a unique position in the village community. Because the mill had to be constantly manned and had to be built where the wind was most favourable, the mill was built outside the village envelope. Uriah Falkner (died 1705) married (1) Alice (died 1678 M.I), married (2) Ann (died 1693). (7) Elizabeth born 1673, married Edward Darvell, shepherd of Aylesbury. Richard Falkner, miller of Warmington, 1667-1737, made a will in which he left property, including his windmill, to his brother Huriah (Uriah), an annuity to his sister Mary Falkner, five shillings to his married sister Elizabeth Darvell, and his house called the Bakehouse to his nephew John Falkner of Warmington. We cannot be certain of the parentage of this John, although he may be the son of the testators brother, John born 1672. John Falkner, died in 1784 aged 87 according to his gravestone in Warmington. He was described as a bolting mill maker in his complicated will written in 1781 and proved on his death three years later. John married twice, having seven children by his first wife and four by his second. (4) Robert born c1733 died 1811. Will, yeoman. Married (1) in 1768 Phoebe Hitchcox of Banbury (c1750-1769). Married (2) in 1772 Frances Robinson (c1741-1809), MI. None resident by the 1841 census.